A warm welcome to the homepage of Beck & Beck Physicians! Beck & Beck have two generations of experience in sports medicine and performance diagnostics combined with up-to-date natural healing and energy medicine. Prevention is the foundation for sustained health, vitality and quality of life. The foremost goal is to maintain health and, in case of illness, to bring about a holistic recovery – ideally through a sustained activation of the body’s own self-healing powers. This approach not only reduces symptoms, but also treats their cause – gently and in depth. 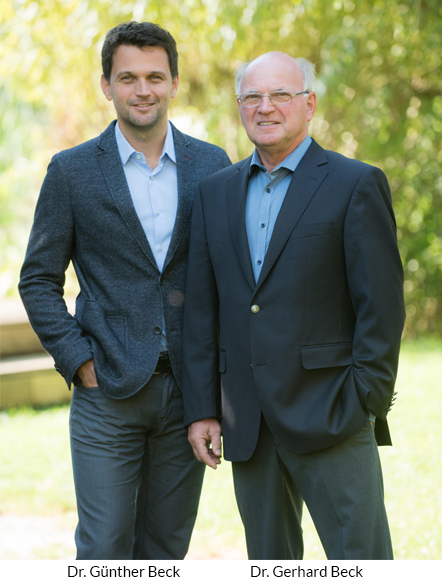 Dr. Gerhard Beck and Dr. Günther Beck combine years of experience in the area of holistic medical diagnostics together with innovative natural healing and energy medicine as well as sports medicine. Based on this experience they developed the vitalis med concept according to Dr. Beck: a holistic package consisting of an innovative method, based on principles of natural medicine, for characterizing disturbances of the regulatory system and blockages in the healing process, combined with classical diagnostics and therapies which are precisely adapted to the individual patient.